After the Republican wave this midterm election season, there's only one tactic left for the President to try. 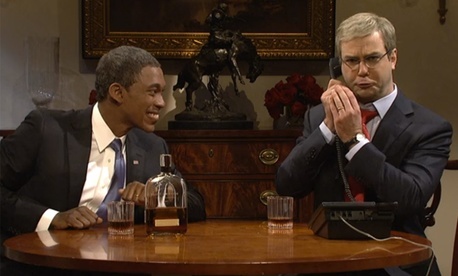 Saturday Night Live imagines that if Obama wants cooperation between the executive and legislative branches, he needs to have an open dialogue with Republican Sen. Mitch McConnell. Just as long as it also involves a stiff drink (or four). Plus: Former Presidents Bill Clinton and George W. Bush converse on social media, the Affordable Care Act's second open-enrollment period begins, and the Islamic State cooperates better than Democrats and Republicans ever could.